This was my first multi-hooping project. 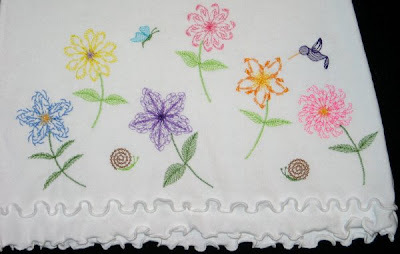 To achieve all the embroidery on the bottom, I printed templates for six different flowers and all the little creatures and laid them out on the bottom of skirt. 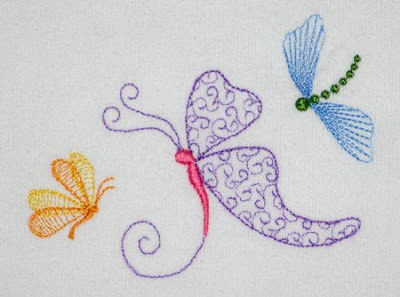 Once I had them arranged the way I wanted, I merged designs within Embird to stitch it in 3 hoopings instead of 6-10. The orange and pink flowers with hummingbird and snail were in one hooping, the yellow and pink flowers w/butterfly were in a second hooping, and blue and purple flowers w/a snail were in a third hooping. 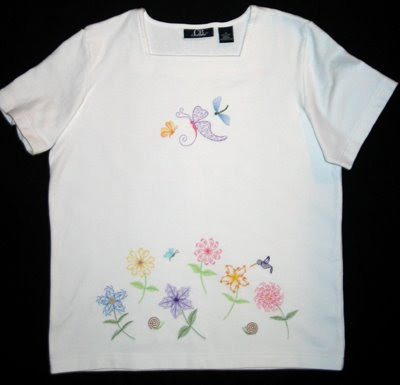 I was a little nervous stitching the last set of designs, hoping I had placed everything well so petals of one didn't stitch on top of stems of another. I was thrilled with the results! For the bodice I found 3 freebies on her site of flying creatures, so I merged them and stitched them in a fourth hooping. I decided to make a matching shirt for myself. 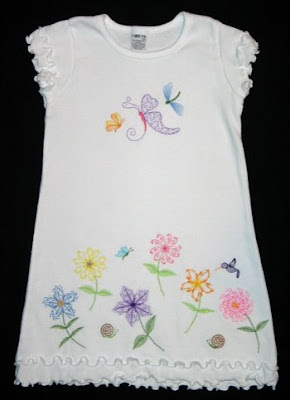 This morning I bought a new white top and stitched it all again. It's basically identical. I did switch thread colors in five places primarily for contrast reasons. I can tell when looking at them in person, but my close-up photos don't show a difference. I was afraid I would need to add an extra flower on each side of the design, but when I put it on, it looks fine. My one regret about this project... 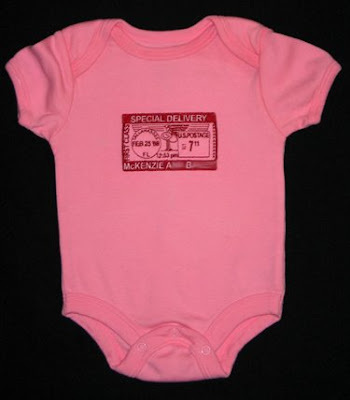 When I ordered the romper for Naomi, I almost ordered this shirt for myself. Wouldn't that have been perfect?? Oh well. I like the style of this square neckline shirt, and I'll be wearing the shirt for years to come, while Annaliese only has a couple months in her dress. 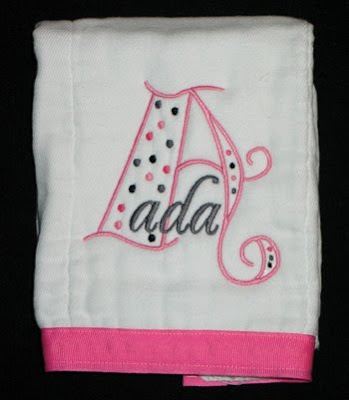 Well, would you believe baby Ada decided to enter the world less than 24 hours after I finished my gift to Sara? 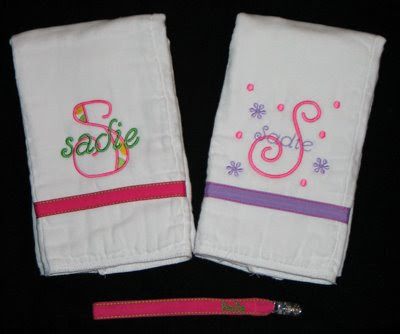 When I found out the news first thing this morning, I realized I needed to hustle on the order Sara had placed for additional monogrammed items! 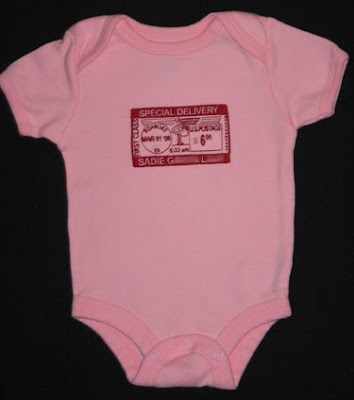 While I was at it, I even stitched Ada's Special Delivery Onesie (design from Sew Terific). 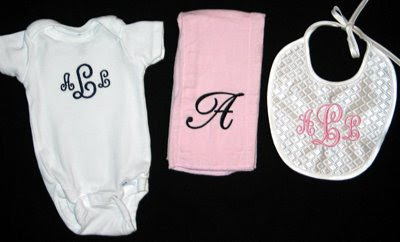 I hope to make a trip to the hospital tomorrow to meet Ada and deliver all the goodies! 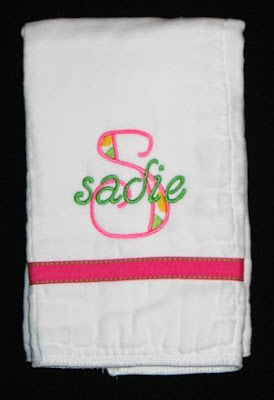 As mentioned before, as of the date of Sara's baby shower they hadn't picked a name for their sweet girl, so I made a ribbon blankie and gave her a certificate for the rest. She hasn't delivered yet, but they have settled on a name, so I was able to finish her gift today. 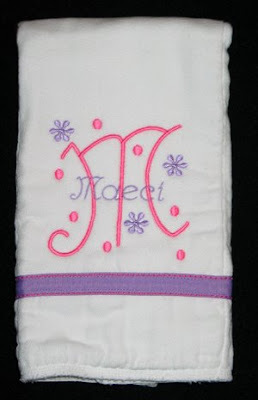 The first burp cloth uses the dot monogram from Sew Forum. I added her name with Embird Alphabet #38. 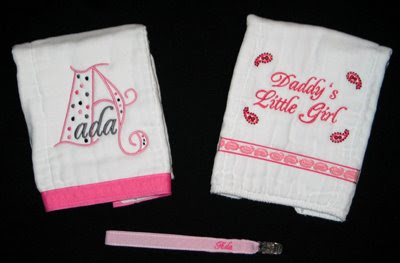 Since Sara is decorating her nursery with black/white toile and pink accents, I chose this color scheme. 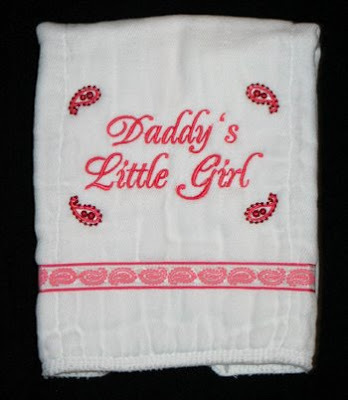 Kime requested a "Daddy's Little Girl" burp cloth, so I used Alphabet #38 again for the text, and added paisley designs to go with the ribbon. 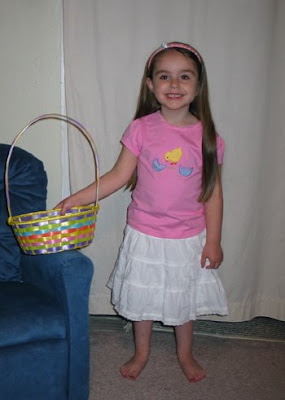 Ready for the Easter Egg Hunt! 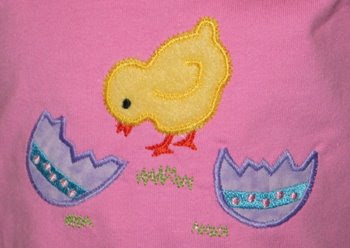 Tomorrow morning is the Easter Egg Hunt at church. Annaliese had a pretty specific request for a shirt, and after several hours of searching high and low for what I wanted that was affordable, this is what we eventually agreed upon. A neat unplanned bonus (and this happened with the unicorn shirt, too) is that one of the headbands that Amy made for Annaliese matches it perfectly, and before today she didn't have anything that coordinated well with it. Woo-hoo! 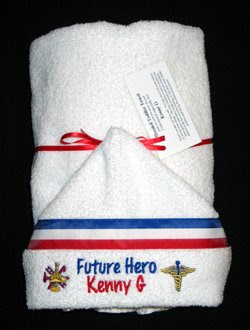 Below are a couple of custom hooded toddler towels that friends have ordered recently. 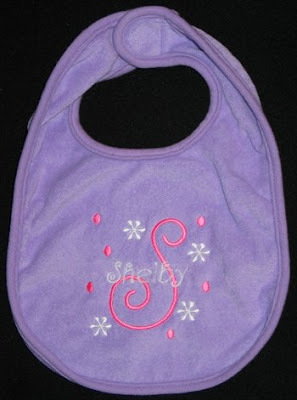 I followed the same pattern as before with one exception -- instead of a washcloth for the hood I used half of a hand towel. It makes the hood a little bigger, it was actually easier to construct, and it's more cost effective. I wish I had tried it sooner! 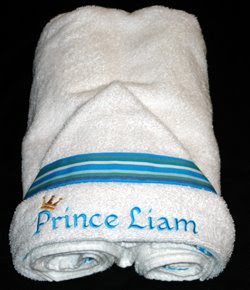 Stephanie requested one as a gift for Liam's first birthday. I use Embird Alphabet #33 for the text. 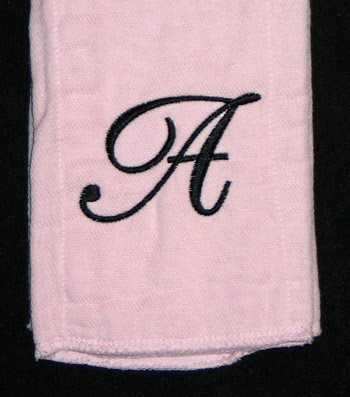 Jan called requesting a hooded towel for a co-worker who recently had a baby. 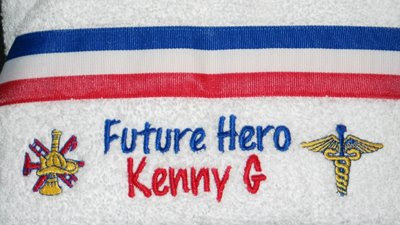 It is my understanding that there are firefighters and paramedics in the family, so with those suggestions I came up with this design for the towel for Kenny G (the baby's nickname). 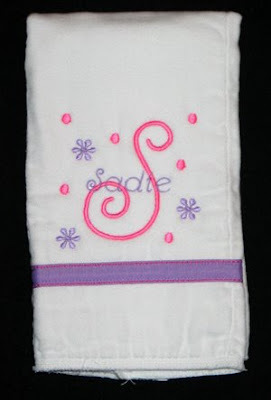 The fire tools and medical symbol came from the Stitchitize Designs that came with my Janome, and I added the text with Embird Alphabet #8. 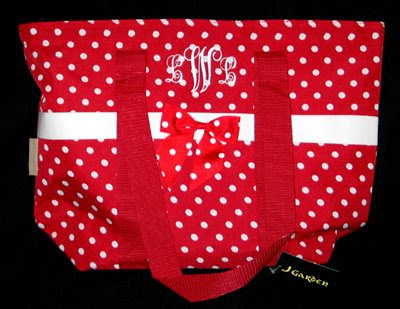 I really like the way this turned out and hope the new parents are pleased! 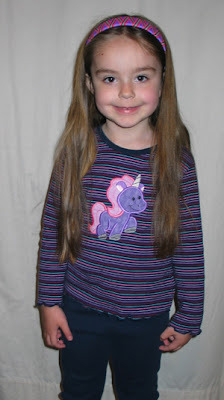 So here's her new pony shirt. Well, actually a unicorn in this case. 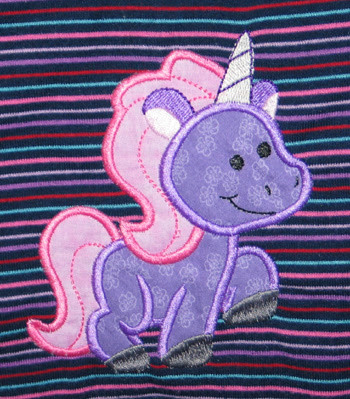 I also had planned to put a different pony on a pink striped shirt. Of course her first question this morning was "Where's the other shirt?" 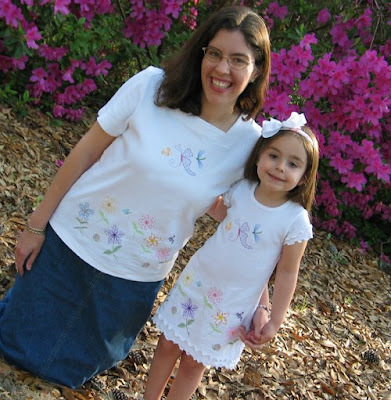 but I'm hesitant to stitch two long sleeved shirts now that it's March in FL... It's time to move to short sleeved shirts! And while I was at it, I actually made something for myself! 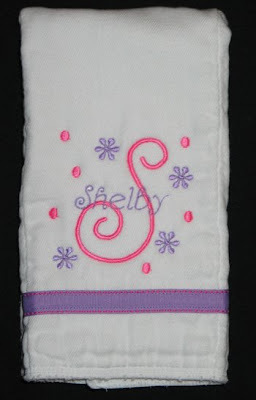 I've been meaning to stitch a water bottle koozie for myself since Kathy gave me some in... AUGUST. I had just enough time before bed last night to do it. I used the Whimsy Dot font from Five Star Fonts. I decided to try variegated thread for the big J, although it doesn't show up well in the picture. I'm not sure what I think about it... I'll probably stick to a solid colored outline in the future. 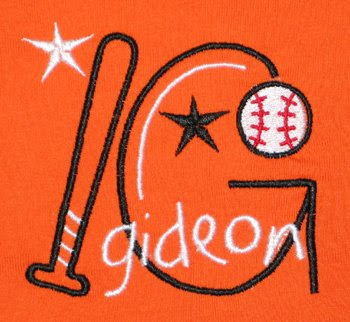 Debby's grandkids are going to be ready to cheer on the Baltimore Orioles when baseball season starts later this month! 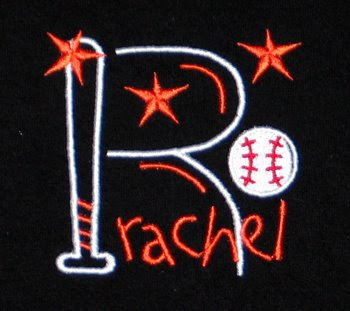 After posting the baseball monogram t-shirt I made a couple weeks ago, Kelli emailed me requesting a shirt for her daughter Rachel. Daisha quickly got in on the action, and after an exchange of emails and designs we had a set ready to go! 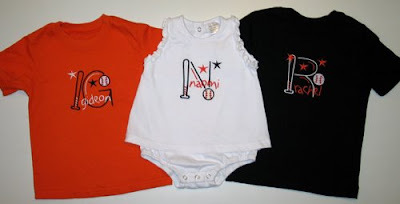 I bought the t-shirts locally over the weekend and we ordered the romper for Naomi from Dharma Trading. 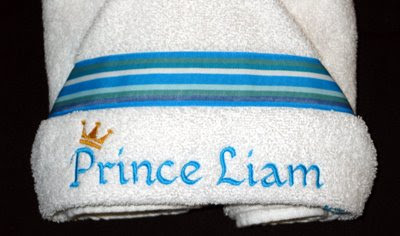 It arrived this afternoon, so I immediately took it to the laundry room so I could embroider it and get this set complete. I wanted to see them all together before we have to ship Rachel's to Berlin. Aren't they precious? 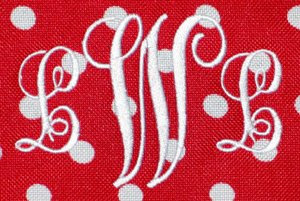 I just love this monogram set from Five Star Fonts. I was also pleased with the little white romper dress. I was able to hoop it such that I only stitched through the "dress" layer, so the back side won't even rub up against her skin! I can't wait to see the kiddos in their shirts! Here are pictures of Rachel in her shirt, and a slide show of Naomi and Gideon in theirs. 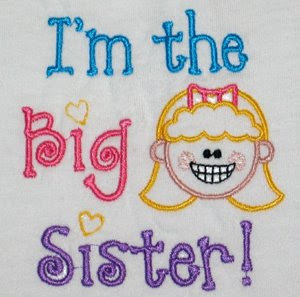 Barbara's co-worker has two bundles of joy joining her family soon as each of her daughters is having a baby girl! 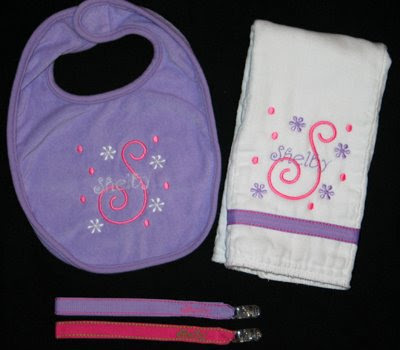 To honor this Barbara ordered baby gift sets. 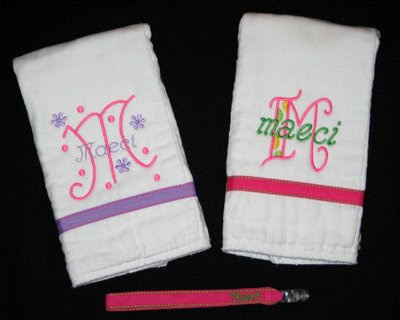 The pink & purple burp cloths are from the Rhumba monogram set available on Judie's yahoo group Sew Crazie Designs. 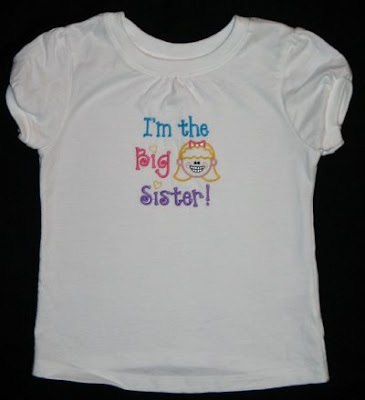 One of these babies is making Emma (3.5 yrs old) a big sister, so Barbara also ordered this shirt for her. 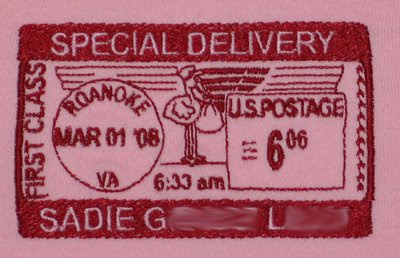 The text came from a free design posted on Sew Forum (no longer available), and the face is a combination of parts from a design set from Embroidery Library. and available on her yahoo group. 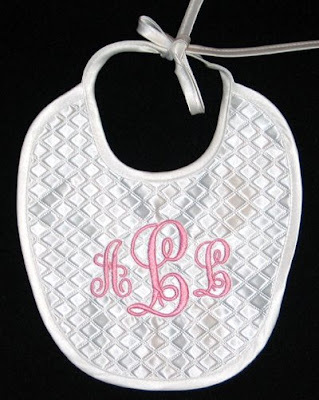 I was even able to resize the name small enough to put on the pacifier clips! 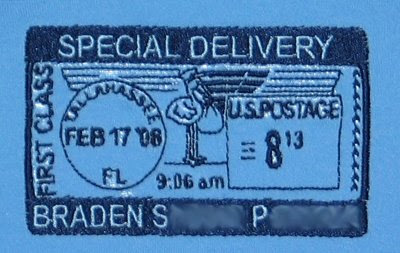 Tammy's order -- Special Deliveries! 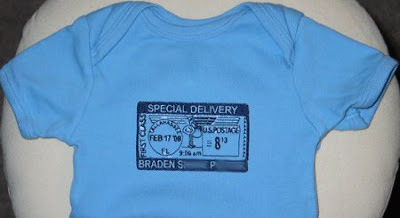 Tammy contacted me a couple weeks ago requesting a Special Delivery onesie to give as a baby gift. She warned me at the time that she would need two more in March. Well one came early, and one arrived on March 1! So I've stitched three of these for her in about 8 days! 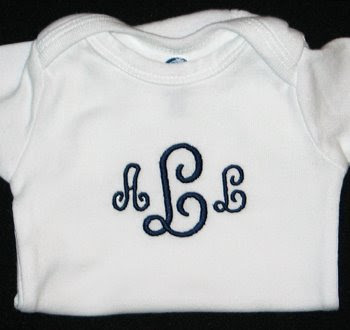 I have depleted my supply of white onesies in my preferred brand, and they aren't available locally at the moment. 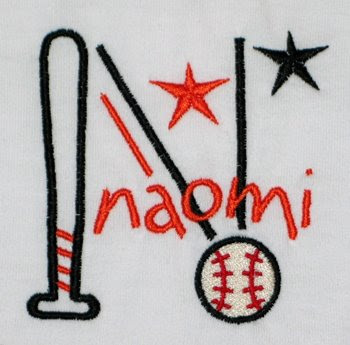 So we decided to stitch these on blue and pink onesies. I LOVE they way they turned out -- they are my favorite yet! I guess the best form of feedback is getting an order! 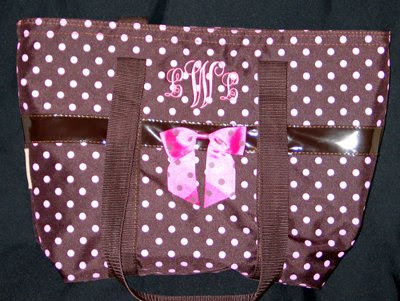 In November Tori received the rag-style diaper bag that Melissa had ordered. 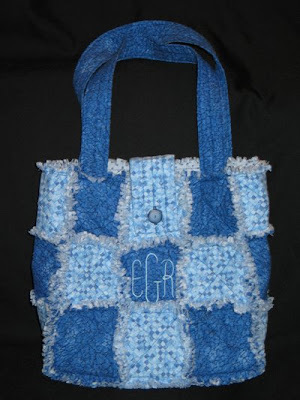 After Christmas Tori told me that she liked it so much that she wanted to order one for a friend. I got it done this weekend and delivered it to Tori this morning. 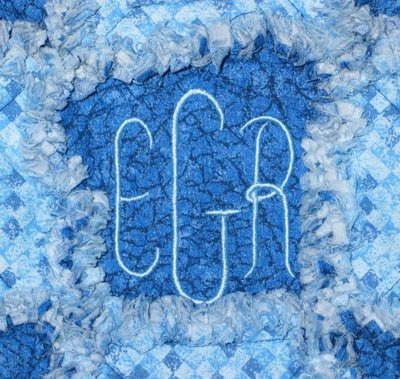 Tori's friend had a boy, and his initials are ERG. Tori requested a blue bag, and these are the fabrics I picked. 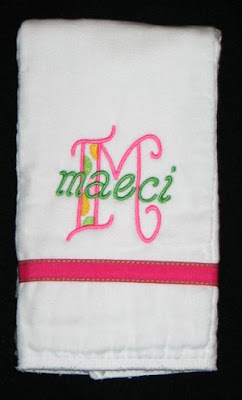 For the monogram, I used the Elevation Monogram from My Embroidery Haven. 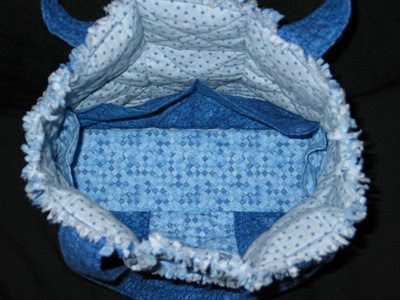 The inside features 7 different pockets to stash goodies, just like Tori's.